Lock in a great price for Lanhydrock Hotel & Golf Club - rated 8.7 by recent guests. Poached eggs were perfectly cooked, and the food overall was very good with a lovely dining area overlooking the golf course and the hills beyond. Great location and very friendly efficient staff. Golf shop staff were also excellent. Some of the food was fairly good - I particularly enjoyed a smoked haddock and perfectly-poached egg breakfast. The location is lovely, and very quiet, because it's attached to a golf club, at the end of a long drive, so it's well away from the road. When visiting family in Bodmin we now always stay here because of its location, comfort and food. It may be a little more expensive than other accommodation but not by much and is certainly worth it. A very relaxing experience, friendly staff and good food. The golf course is testing but fair and set in lovely surroundings. I recommend this hotel for anyone wanting to get away from it all for a break. We like the rural location and it's closeness to the town. The rooms are quite spacious and comfortable. It was in a peaceful quiet location. The rooms were clean with lovely views. The staff were really lovely. One of our top picks in Bodmin.Less than a mile from the A30, the Lanhydrock Hotel offers lovely views of its 18-hole golf course. With free Wi-Fi throughout and free parking, the hotel offers stylish and modern en-suite rooms, along with a modern fitness suite. The golf course provides a stunning backdrop for the airy Nineteen Bistro. Focusing on modern British food, the menu features local seafood and fresh produce. The bar serves snacks and light meals and has a plasma-screen TV showing sporting events. Home-made cakes and cream teas are available throughout the day. Special rates are available for guests using the Lanhydrock Golf Club. Expert tuition is also available. 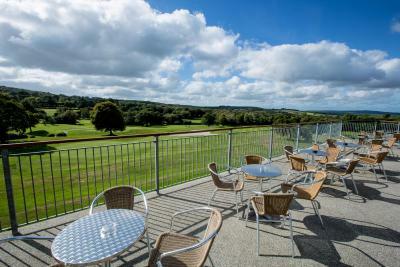 The golf course also provides charming views, seating areas and strolls for non-golfers. Lanhydrock House, a magnificent Victorian country house, is less than a mile away. The Eden Project and the Charlestown Shipwreck Museum are both within 15 minutes’ drive from the Lanhydrock Hotel and Golf Club. Lanhydrock Hotel & Golf Club has been welcoming Booking.com guests since 31 Aug 2006. When would you like to stay at Lanhydrock Hotel & Golf Club? With views of the golf course and surrounding countryside, these rooms have Hypnos beds with crisp white linen, and an en suite underfloor-heated bathroom with power shower and large bath. Pascal Morabito toiletries and large fluffy towels are provided, along with tea and coffee making facilities with biscuits. Each room also has a flat-screen TV with Sky channels. With Cornish countryside views and Hypnos beds with crisp white linen, these modern rooms have an en suite underfloor-heated bathroom with power shower and large bath. Pascal Morabito toiletries and large fluffy towels are provided, along with tea and coffee making facilities with biscuits. Each room also has a flat-screen TV with Sky channels. Offering great views of the stunning Cornish countryside, this suite has a super king-size Hypnos bed with Egyptian cotton bed linen, a Nespresso coffee maker, and a TV in both the bedroom and lounge area. 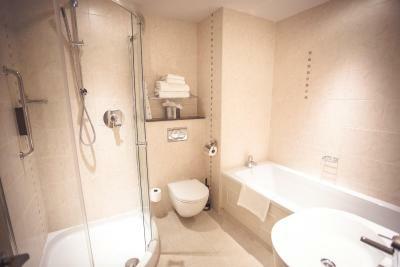 There is air conditioning, underfloor heating in the bathroom and a heated towel rail. Two suites are available: the first-floor suite offers a large balcony with outdoor furniture, while the ground-floor suite has a covered terrace with views of the golf course. House rules Lanhydrock Hotel & Golf Club takes special requests - add in the next step! All children under 2 years are charged GBP 15 per night for children's cots/cribs. Lanhydrock Hotel &amp; Golf Club accepts these cards and reserves the right to temporarily hold an amount prior to arrival. Lanhydrock Hotel & Golf Club accepts these cards and reserves the right to temporarily hold an amount prior to arrival. Please, note pets are not allowed in this hotel. I had problems getting hot water from the shower and the bathroom was cold. Very poor service in the bistro on the evening of my arrival. Waiting staff were all young, and spent a lot of time laughing and talking loudly to each other at the bar. The person who greeted me suggested a window table, and when I said which one I'd like, he said "Knock yourself out!" I know that this is current vernacular, but it's not what I expect when dining out. My drink order was taken, and arrived quickly, but I then waited 25 minutes before I was even given a menu! The person who brought this appeared to have just started her shift - she wasn't in the room when I arrived - but picked up quickly that I wasn't being attended to. When she gave me the menu, she turned to point out the "Specials" boards, only to find that they hadn't been put in place... I had a 2-night stay, and was disappointed that the bistro menu was not available on either evening. The bar menu is typical "pub grub", which I'm less keen on, so I ordered from the limited Specials. On the first night the meat (pork loin) was OK but the sauce was insipid. The next evening, I ordered crab fishcakes. These had almost no flavour, and were of a uniform paste texture inside the overcooked crumb coating. There were a few issues with the cleanliness of my room: both drinking glasses in the bathroom had lip marks, and there were mould marks in the bath sealant. The bath panel had some warping, owing to water penetration, and a bit of its decorative moulding was missing, which made the room look uncared for, but which would have taken very little time and money to replace. In the bedroom, there was a substance (melted chocolate?) on the lid of the kettle, and dust, fluff and a paperclip in one of the drawers. I managed to come home with the room key, because I wasn't reminded to hand it in when I checked out. TV is a bit small and bed was not that comfy with hard pillows. Did not sleep that well. Not applicable - everything met my expectations! Very good value for money, in a lovely quiet location. I had a good night’s rest and breakfast was generous. Lovely to have fresh fruit salad and the choice of a cooked breakfast too included in the price! Staff were professional and friendly. I would definitely stay here again. The bar area was cold - had to wear an extra layer to keep warm. The food was good but not quite hot enough which did spoil it. The restaurant serves bizarre portions - some main dishes were 4 times the size of others - seemingly of a questionable quality as well, judging by the quantity of food left on plates by most customers. What a waste!